We have been asked many times and by many folks what our thoughts are on crossbow slings. So many times, in fact, we wanted to write a short article discussing some things you should be looking for when purchasing a sling. The TenPoint Neoprene Sling offers a comfortable feel and also has a specific place for your de-cocking arrow. This will use the front and rear swivel mounts and has quick detach mounts. If you are looking for more comfort when carrying and are not worried about being able to shoot quickly, the Gameplan Gear Xbow Crossbow sling allows you to carry your crossbow in front or behind you and does so with a backpack type set of straps. There is no drilling or any type of special installation with this one. Another potential choice from Gameplan is the Gameplan Gear Recon Tactical Crossbow Sling. This mounts on permanent swivels and has a large pad that also features a storage pocket and a thumbhole. The thumbhole lets you comfortably hang your arm from the strap which allows for additional control of the sling while walking. Finally we have Barnett’s Talon sling, which is a very decent sling for budget minded buyers. What Is The Most Popular Type of Crossbow Sling? The most common style of sling is the two-point sling, which is similar in function and design to that found on most hunting rifles. It generally consists of a mounting point on the underside of the barrel near the muzzle, and a second mounting point on the stock. Typically this style of sling is going to have some type of quick disconnects as many shooters will tend to remove the sling once they get to their stand since the sling can sometimes get in the way, especially if you have a quiver attached as well. Most crossbow manufacturers offer this type of sling for use with their crossbows, and there are also many companies that offer a more universal design for crossbows as well. As you look at the mounting of the two-point sling, you need to determine if your crossbow comes with sling mounts installed from the factory, or has specific spots (either rails or other suitable mounting points) where you can install the sling mounts. Typically, the sling mounts will be installed in a permanent fashion to ensure they do not come loose and the quick disconnects will be on each end of the sling. If you find that your crossbow does not have permanent mounting points or rails, you may seriously consider taking it in to your local shop to let the professionals take a look and help determine the best mounting locations along with the best hardware to use. We have had occasions to add mounting points to some of our crossbows and have done so using mounting kits for rifles, but we are very experienced in understanding the balance points on our crossbows to ensure we have the proper mounting locations identified. Typical two-point slings are going to be best selected by evaluating certain criteria. We will generally judge them based on the below factors, in this specific order. After each we offer a short discussion about what to look for and why. How Durable Is The Sling? This is a critical factor for any sling as you must be able to rely on the sling to perform every time. If the sling fails, your crossbow is going to fall and your hunt is over for the day. Even if there is no apparent damage to your crossbow, you are going to need to ensure you scope is still zeroed, not to mention the amount of noise that has just been made in your hunting area. A good sling is going to be made from a sturdy material such as nylon, and is going to have reinforced sling ends. If you see a sling that is starting to fray, pay close attention to ensure the damage is not structural. Does The Sling Have Good Weight Distribution? A good sling is going to have a large pad where it contacts your shoulder to ensure good weight distribution. The more narrow the strap, the more you are going to feel pressure points as you carry the crossbow. Individual tastes will vary, but in general, the larger the pad the more comfortable your sling is going to be. Is it adjustable? That is something that can also go a long way towards ensuring your comfort. A sling that is too long or too short is not going to carry your crossbow in the proper position and you are going to likely end up carrying the crossbow in your hands, thereby defeating the whole purpose of having a sling in the first place. A lot of crossbow users are only going to use a sling to carry the crossbow to and from the deer stand. One thing that is often overlooked is whether a sling has any accessory rings or mounting points. There are some slings that will have a mounting ring for a range finder, which can be very handy if you do any stalking. Others have loops to attach an unloading bolt to keep it handy and to not take up valuable quiver space. How does the quick release work? Is that going to be something that will work for you? Some users have bigger hands or fatter fingers, and not all quick releases will function the same. Ensuring you play with the releases and become familiar with them can mean the difference in a smooth and quiet release or a clumsy failure at the critical moment. This is again something that is totally up to the user. Unless you are getting a glow-in-the-dark or bright white sling, the appearance likely isn’t going to impact your hunting success. We only bring this up as a lot of folks take great pride in their hunting rigs, so getting a sling that has a complimentary appearance will be important to some. Black is always a safe choice as it goes with anything or any camo pattern. If you do go with a camo pattern and you do care what your rig looks like, pay attention to the pattern and make sure it is something you are going to be happy with when paired with your crossbow. We know the above factors might seem obvious to some, but it is easy to overlook some facets when you are purchasing…especially if purchasing online. Don’t be afraid to take a little extra time to read reviews on various slings. Remember, just because your crossbow comes with a sling doesn’t mean it is necessarily the best one for YOU. Which Sling Should You Buy? So now, after having discussed the most common sling type out there and different factors to consider in their selection, we get to the single most commonly asked question(s): What sling do I use and why? This is a question that can get many folks singing the praises of their specific setups and you will often get as many opinions as peopled asked. My personal preference is one that allows for the crossbow to be carried in a ready position where a shot can be taken while stalking. Not all crossbows are set up to accept a single-point sling, in fact, most are not. For those not familiar with the single point, this is the style most favored by military personnel. It allows the carrying of their weapon in a multitude of positions, but most importantly, it allows the weapon to be immediately shouldered while still mounted to the sling. Another variation is the three-point sling which can also allow the shouldering of a weapon, but is a bit more complex to use. Stalking may not be everyone’s forte, so why the importance of a sling that allows for shouldering of your crossbow? Believe it or not, the answer is both comfort and stealth. By having a sling where the crossbow is in front or by your side, you never have to worry about hanging up on tree limbs or brush. 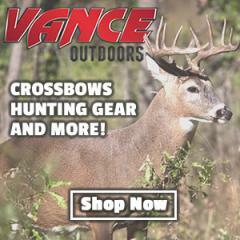 Because the crossbow is in front or immediately beside your body, you are going to be able to visually ensure your crossbow is not coming into contact with anything as you walk. You will also find that being able to place the crossbow along your body with the limbs in front and behind you, you won’t have any parts of it digging in to you as you walk. Whether you think you will need to shoot when you are on the way to your stand, having the option is really nice. Think back to your many walks to the stand and I am willing to bet you will remember at least one great shot that you missed for lack of having your weapon ready at hand. If you haven’t had this happen yet, you will, trust me on that. Single point slings are also going to be subject to the same criteria as described above for two-point slings, but you are likely going to find your choices much more limited. This style will also likely be more ‘tactical’ in appearance than most traditional hunting slings. I recognize that what works best for me won’t work for everyone, but I am simply discussing my preference and why. Knowing that single point slings aren’t as common, if you want to learn more, you might look at the CAMX Lo Ready™ Sling as well as the Carbon Express 1-Point tactical sling. These will give you a good idea of how they work and why I lean towards this design. If you have more specific questions about slings or any other crossbow questions, please don’t hesitate to email us. We are here to help you learn and really enjoy doing so!